The oxygen reduction reaction (ORR) is important to the functional readiness of a fuel cell. The oxygen reduction reaction (ORR) is one of the most studied reactions in the field of electrocatalysis. The ORR in aqueous acidic electrolyte can proceed through different pathways depending on the reaction conditions. Rotating ring disk electrode (RRDE) experiments allow the reaction to be studied in hydrodynamic conditions to determine kinetic properties via the Levich and Koutecký-Levich equations. Mechanistic information is simultaneously obtained from the reaction of intermediates at the secondary (ring) electrode. 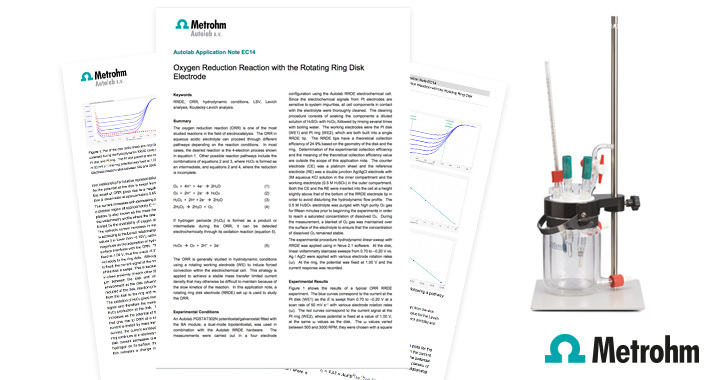 This application note describes how the RRDE from Metrohm Autolab can be used to study the ORR. An Autolab PGSTAT302N potentiostat/galvanostat fitted with the BA module, a dual-mode bipotentiostat, was used in combination with the Autolab RRDE hardware. The measurements were carried out in a four electrode configuration using the Autolab RRDE electrochemical cell.